Good. 0141043768 cover is different to picture shown. 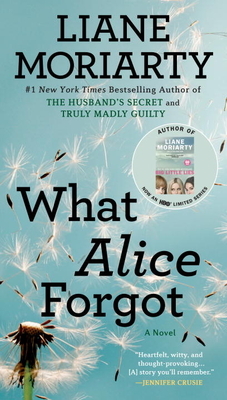 I loved reading "What Alice forgot". The style of writing reminded me of "gone girl". The writer improved on the "gone girl" style that switched from the perspective of the husbands thoughts telling the story to the wife telling her side of the story through her diary. In "What Alice Forgot" you get Alice's perspective as she is regaining her memory, which in itself is creative writing. You also get her sisters perspective through a "diary" titled "Elisabeth's homework for Dr. Hodges". I don't want to explain it and spoil it for the reader. But lots of juicy secrets are in the explanation and writing of her journal. A third perspective is given through "Frannie's letters to Phil". I'm not even going to comment on who Frannie and Phil are. Trust me, you will enjoy letting the story unravel as the characters intertwine and connect with their thoughts and perspectives. It's that Ah Ha moment after feeling misunderstood and you realize someone else has a similar struggle and they do get what you are going through. This book has as many twists and turns as a murder mystery. It didn't need a scandal, crime or murder. What made it interesting is how "upbeateveryday life" and relatable it was. Several times the author leads you in one direction and ends the chapter with an unexpected cliff hanger. I could not put this book down. All the way up to the end of the book, even the epilogue secrets are being revealed about the characters connecting them through their common circumstances you never knew they both shared. I was tempted to give it 4 stars because I hated the last 30 pages. The decisions at the end that the Alice made was frustrating to me. I wanted to "fix" her problem but she was not cooperating. I was contemplating archiving the book and finishing the ending how I wanted it to end. The author redeemed herself with the epilogue. Maybe I wasn't the only one that didn't like the ending or think it fit with the personality she created for the main character. It was a wonderful journey looking at the ideas and issues from the very different perspectives of all the characters. Analyzing how past experiences effect a person's personality and change their values, beliefs and impact decisions. All of the characters were very relatable. I found it insightful to have the opportunity to stand in their shoes for a while. I would imagine many women will have one character that they relate most to. For me it was Alice. I'd like to make my husband and kids read the book so I can say see, I'm not crazy, other people feel this way. Maybe I'll get lucky and they'll make a movie of it. Although, I could never get them to watch "I don't know How does she does it" with Sarah Jessica Parker after they made the movie for that book. I guess it is hopeless getting 4 boys and my husband to understand and relate to the only woman in the house. I'll just have to be happy knowing I'm not alone. There is nothing wrong with "me", it's them...right? This was an insightful thought provoking book that was fun to read. Great book to relax with on the beach or poolside.